Since 2002 I have welcomed musicians from around the world to my central London workshop. Up above a quiet square, I concentrate on making new instruments and tonal adjustment. Opening my own studio was the culmination of a dream I first had in a dull history lesson as a teenager. 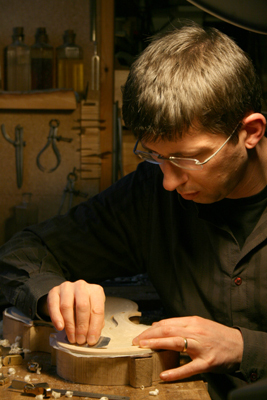 Back then, I thought violin making would be the perfect combination of my interests: music, engineering and woodwork. 20 years on, I can’t imagine doing anything else. My journey to London began in South Germany, where I grew up in a big, noisy, music-loving family. I moved to the UK to study at the Newark School of Violin Making, from where I graduated with Distinction. My next stop was Berlin, and three years as a maker and restorer for two workshops. In 1997 I was appointed Workshop Head at the London shop Frederick Phelps, and spent five enjoyable years working with London players, teachers, students and supervising a team of talented workshop staff. I frequently collaborate with fellow makers from around the world. I’ve regularly been to the summer lutherie and acoustics workshops organised by the Violin Society of America at Oberlin College, Ohio, and have taken part in lutherie weeks in France and Scotland. I’m particularly interested in how acoustics can improve violin making. I still play the cello in local orchestras and chamber groups, although my biggest fan is my small son. I’ve written articles for The Strad, and been featured in The Strad and Classical Music magazines.